Swimming pools are great to have when you have family and friends over for a pool party. But when it is no longer used or wanted and is becoming too expensive to repair, it can be an eye sore, taking up a lot of your backyard real estate and money for maintenance. 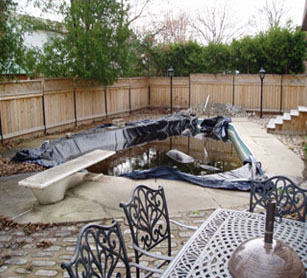 At Markstone Landscaping, we can create a usable and tranquil outdoor living space by removing and backfilling your unused pool. No matter what size and type of pool you have (vinyl liner, steel, fiberglass, concrete, etc. ), we can get the job done. Your pool will be backfilled with clean and compacted fill to minimize sinking. We will also complete the space by covering it with your preferred choice, whether it be with rich Dwarf Kentucky Bluegrass sod, concrete, or interlock. We make sure the pool is completely covered and the newly reclaimed space perfectly matches the surrounding area for you to enjoy. Removing or backfilling a swimming pool may seem like a major overhaul, however, in reality, it does not take long and is rather straight forward. Click here to learn about the typical process of filling in a pool. For more information or to schedule a free, no obligation quote, contact us. 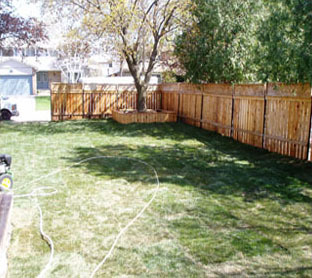 Our extensive experience can help you create the backyard oasis you have been longing for. If you have a pool that you no longer want or has become too expensive to repair, we will backfill your pool with clean and compacted fill to minimize sinking. We’ll also make sure the newly reclaimed space perfectly matches the surrounding area.